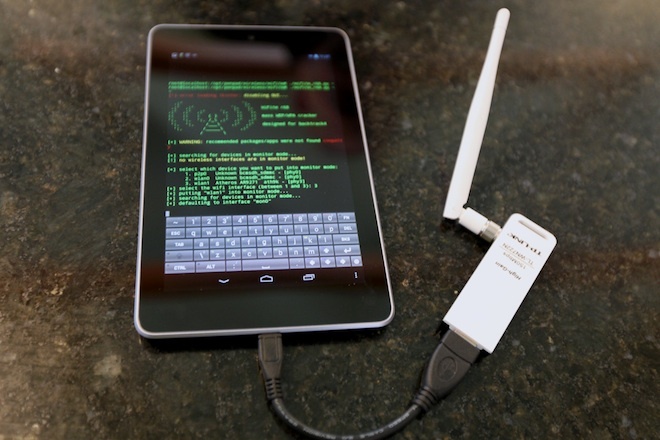 Security tools company Pwnie Express is making a network hacking focused Android device called the Pwn Pad. The device is based on the Google Nexus 7 specs, with USB-based Bluetooth, Ethernet and WiFi to gauge the security of a network beyond what Google's tablet can manage on its own. Pwn Pad will be introduced at the RSA security conference in San Francisco next week and Pwnie Express is also releasing the Pwn Pad source code. This will allow hackers to download the software and get it up and running on other types of Android phones and tablets. “Every pen tester we know has a phone and a tablet and a laptop, but none of them has been able to do pen-testing from the tablet,” says Dave Porcello, Pwnie Express’s CEO said to wired. "Pwnie Express solved the problem by getting a TP-Link wireless adapter to support packet injection on Android. (It’s the white device with an antenna that’s plugged into the Android phone in the picture, above.) This may be a little more cumbersome than hacking the wireless chip that Android ships with, but the TP-Link’s antenna give it perhaps 10 times the range". If you are looking for iPad version of the Pwn Pad, please stop your imagination here! Because to create such devices, Pwnie Express needs to do kernel level modifications and for that they already contact Apple for permission, but as always.. jailbreak haters said "NO". Well, it hopes to be a great new way for people to quickly and easily test out the security of their websites and find any flaws. The price is set at a smooth $795.